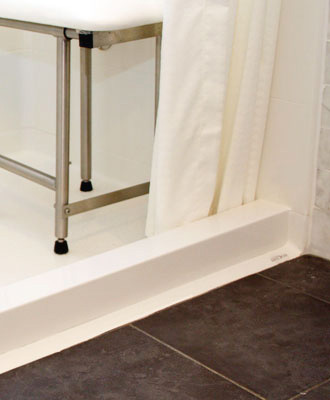 Adding shower accessories to your Freedom ADA or Accessible Shower will give you more confidence and independence, so you can enjoy the bathing experience you deserve. Making showers easier and safer for everybody, we offer only quality shower accessories in a range of styles to suit your bathroom design. Visit Freedom Showers to shop the best grab bars for you. You will be amazed at how much more confident you’ll feel, stepping in and out of your shower, and moving around the bathroom, when you use these beautiful grab bars for support. Available in a range of styles and price levels, you will have no regrets when you add stainless steel support bars anywhere in your bathroom. Visit Freedom Showers to find the right shower seat for you. Adding a shower seat can make a world of difference for someone who struggles with balance or standing for more than a few minutes. You deserve the option to sit down while showering, if you want a more relaxed bathing experience. We offer a large variety of sizes and styles to suit your bathroom design, from durable phenolic tops or comfortable padded seats. Click here for installation instructions or to order online. One of the biggest questions we get asked about our Freedom Accessible Showers is “How do I keep water in the shower stall?” Collapsible water retainers are the answer. They can be ordered for any shower opening size, and adhered to the low threshold to prevent water from coming up out of the shower pan. For even more protection, combine with a weighted shower curtain. See specs or Order online here. With low threshold showers, the biggest concern is how to keep water leaking outside the shower curtain. The secret is to have a thicker, weighted shower curtain that doesn’t easily blow out over your bathroom floor. The heavy curtain with weights in the bottom seam, stays put. For added protection on zero barrier showers, combine this curtain with a collapsible water retainer for the ultimate water barrier solution. Sturdy 1” stainless steel tubular design. 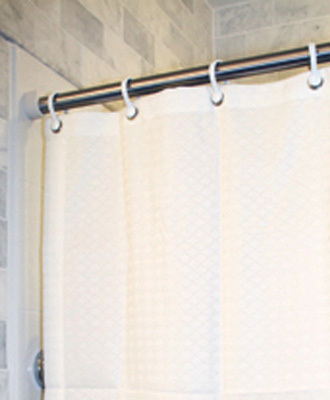 Shower curtain rods are made from 1″ tubular stainless steel and are available for all sizes and styles of Accessible and ADA Showers. Comes with U cups for solid installation. Having an adjustable height shower head is ideal for any bathroom that may need to accommodate people with different needs. The easy to use bracket on the glide bar allows you to set the shower head at different heights to work for someone standing or sitting. 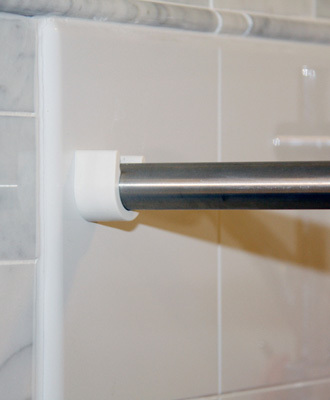 The stainless steel glide bar can also be used as a grab bar for added support. Use this shower kit to be ADA compliant. Feel safe in your own shower, by installing a Pressure Balance Mixing Valve, which keeps the water temperature constant, no matter what else is going on in the home. No sudden changes to hot water when someone flushes a toilet. The lever style is easier to use for everyone. Available in lengths to fit any Freedom roll in shower. 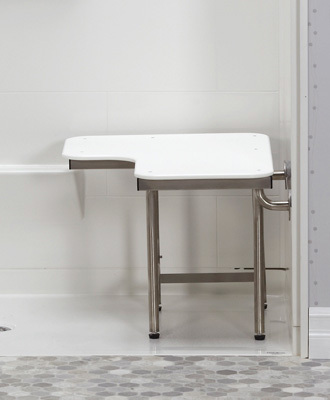 Perhaps you’re not ready for a barrier free shower, but you want to plan ahead. Installing an accessible shower with a Semi Permanent Threshold Adapter gives you the flexibility you need to have the best of both worlds. This threshold adapter easily converts your roll in shower to an easy step shower, gives you the option to install a shower door, and gives you options for the future. Often the last thing you think of but the first thing you need when installing a Freedom Shower or Pan. The 2” caulkless drain is furnished with a stainless steel strainer, a water-tight gasket and a securing nut for easy installation with ABS/PVS pipe connections.